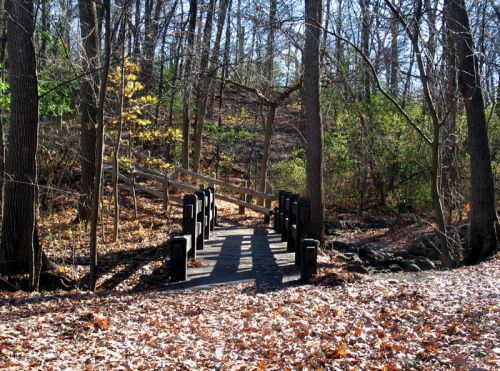 Jacobus Park Nature Trail is a outstanding example of an undisturbed woodland environment remaining in the highly developed urban setting of metropolitan Milwaukee. Location: Jacobus Park, 6501 W. Hillside Ln. Wauwatosa, WI, at Jacobus Park in Wawautosa south side of Menominee River between Hawley Road and north 68th Street. At Jacobus Park in Wawautosa south side of Menominee River between Hawley Road and north 68th Street. Jacobus Park in Wauwatosa, Wisconsin, is an outstanding example of an undisturbed woodland environment remaining in the highly developed urban setting of metropolitan Milwaukee. With more than 160 native species surveyed, among them several state-listed Threatened and Endangered Species, it is a unique natural outdoor classroom for schoolchildren and area citizens.